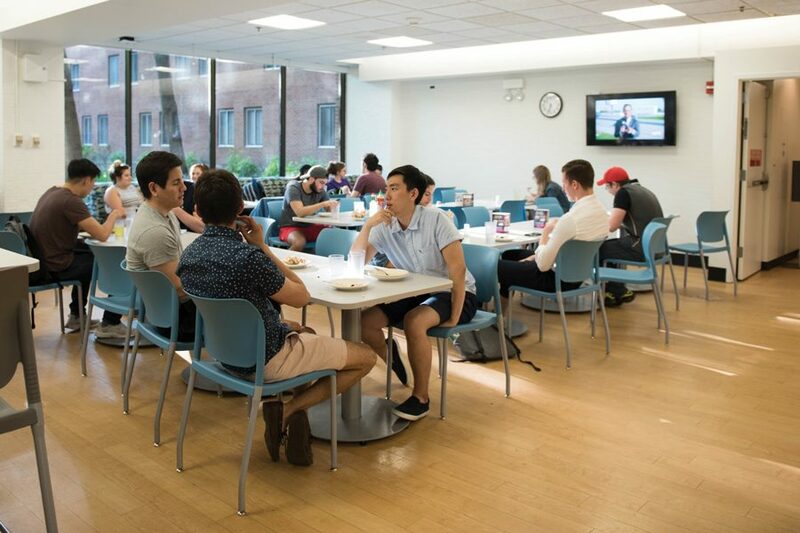 Students eat at a Foster-Walker Complex dining hall. Chartwells Higher Education, which will replace some dining operations in the fall, said it will not participate in the federal E-Verify program. A subsidiary of Compass Group North America said it will not participate in the E-Verify program when it takes over Northwestern food service operations in the fall. Michael Bennett, a district manager for Chartwells Higher Education, announced the decision Wednesday at an Associated Student Government Senate meeting. E-Verify is a federal service used to verify a person’s identity and eligibility to work in the country. Employers with federal contracts are required to participate. Among the demands released earlier this month, student activists had urged Compass to not use E-Verify for current campus dining workers. Chartwells, a subsidiary of Compass, will replace Sodexo as NU’s provider for dining halls and some retail operations on campus. A number of other Compass units will assume vending, athletics concessions and Kellogg School of Management dining. The news comes a few weeks after the company struck a deal with the food service workers’ union, settling some concerns workers had raised about uncertainty during the transition. The agreement guarantees job security for Sodexo and Aramark employees who will now work for Compass. It also maintains benefits for the workers — including seniority, health insurance plans, pensions, vacations and sick days — though the full details of the agreement were not publicly announced. In April, about 70 workers marched to ask their current employers, Aramark and Sodexo, to provide support throughout the transition. After UNITE HERE Local 1, the union representing NU food workers, announced the agreement, several food service workers praised the deal. It is unclear how many, if any, undocumented workers are at Northwestern, as the University does not publicly disclose that information. But the issue is salient, as workers circulated a petition calling on Compass to accept I-9 identity verification forms instead of using the E-Verify service. In a Thursday interview, University President Morton Schapiro credited students, who had urged Compass to not use the verification service, for bringing attention to the issue. At Wednesday’s Senate meeting, Bennett did not address workers’ concerns that they would leave positions they had held for years, but said workers can expect some changes in their work. “We want to give them a new sense of empowerment, new uniforms, new equipment, new strategies,” he said.